The Riverside Museum will open in Glasgow this spring, with five areas for corporate meetings and events. The £74m development, beside the River Clyde at the mouth of Glasgow’s other main river, the Kelvin, is adjacent to Glasgow Harbour. The museum can also be hired on an exclusive-use basis, capable of hosting a reception for a maximum of 800-900 guests. Meeting areas include ‘The Street’, a reconstructed 1900’s street that will house old buildings, pubs, cars, and a subway station with its own tram and tramlines, which can be used for a themed drinks reception for approximately 100 guests. A glass-fronted cafe overlooking the waterfront will provide space for up to 100 guests and can be reconfigured to offer a dinner setting while the Education Suite can seat between 50-60 delegates board room style. Two further spaces include the Boardroom, a self-contained room offering a more intimate meeting space for up to 20-25 delegates and the Mezzanine Level which can be used for a reception for up to 150 people. 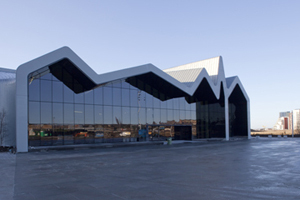 The venue’s futuristic structure has been inspired by Glasgow’s maritime history and designed by architect Zaha Hadid. It will replace the existing Museum of Transport at the Kelvin Hall and will house Glasgow’s transport collection as well as new exhibits.